... a beginner's guide to OSGi on the desktop in which none of the following are discussed: history, politics, the spec, mobile devices, Sun, project JigSaw, any JSR, and certainly not any past spec leads (the poor souls). Why should you care about OSGi? 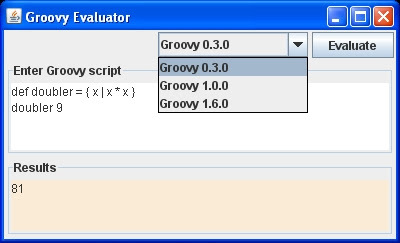 The screenshot below is a sample Swing app that evaluates Groovy script against any version of Groovy you have installed, despite that fact that these Groovy versions are not compatible and cannot typically be loaded side-by-side into the same JVM. The Groovy versions available in the UI are updated dynamically as new jars become available on your system with no restart of the frame necessary. The whole thing is 229 lines of code, 147 of which are Swing related. OSGi gave me true sandboxed modules and dynamic service discovery in 82 lines of code and no XML. Wow. If this doesn't excite you then your heart must be dead and you should seriously consider that MBA program you've been thinking about. What's so cool about this? These three versions of Groovy should not be allowed to coexist within the same JVM... they are incompatible. The Java classpath mechanism is a linear search order of a set of directories where classes are loaded. If two libraries use the same name then you have problems. The full set of all dependencies in your application typically needs to be compatible, but not so in an OSGi world. Dependencies can be privately held so that other modules don't see them. Furthermore, OSGi makes it easy to detect available services and be notified when new services become available. You can handle these notifications any way you like, including loading the service without shutting your application down. So your web application can gracefully handle the rollout of a new "User Authentication Service" without a restart. And this example shows how to do all of this in 82 lines of code and zero XML. The whole system runs off of special class loaders and extended Jar manifest files. A module, or OSGi "bundle", is packaged as a standard Jar file, and may include other jar files within. The manifest of the jar declares what packages or classes it exports publicly and what packages or classes it uses internally. The specialized class loaders make sure that your module never sees any of the classes from other modules that aren't publicly declared. Thus, an app my reference Groovy 0.3, 1.0, and 1.6 all at the same time. Goodbye classpath, hello modules. Service discovery is achieved by simply asking the container for registered bundles that declare to export a specific Java interface. Also, registering a listener with the container will notify your app when services come into (and go out of) existence. Your app no longer has a "public static void main". Instead, it has a start and stop method, and the container will call these when your app is started and stopped. Within start you may register yourself as a service or pull services out of the registry (or "context"). Within stop, you'll probably want to release any services you're using. It gives you a console in which you can install bundles (jar files, remember) by their URL. Once installed, the bundle can be started, stopped, refreshed, and uninstalled. As you can guess, having your bundle started causes your start method to be invoked; stopped and your stop method gets called. When a service is started, any service listeners are notified of the new service, and likewise when stopped. It can be done programmatically too, and couldn't be much easier. How does this example work? Running three different Groovy bundles within one UI required a total of 5 components: the user interface (Groovy Evaluator), the interfaces for the services (Groovy Provider), and the three service implementations (Groovy Provider Impl 0.3, 1.0, and 1.6). 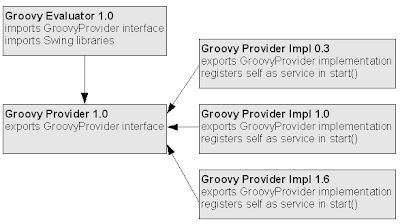 The Groovy Provider exports itself as version 1.0. There is nothing in this jar file except a single POJO and the manifest specifying Export-Package: org.sample.provider;version="1.0.0". * a groovy bundle actually needs to futz with the classloaders because of all the reflection it requires, but that's not important. But a more robust way is to subclass ServiceTracker and listen for service events. The code that does this is quite simple and can be found at: http://svn.assembla.com/svn/SampleCode/osgi/groovy-evaluator/src/main/java/org/sample/Activator.java. In this example, the JFrame simple adds and removes entries from it's JComboBox when new services are started and stopped. This project's source code is a good place to start. Specifically, you can check to see exactly how the manifest files are created by looking at the build scripts (the several build.gradle files). There are a few other good resources as well. Sunil Patil wrote a 3 part writeup with full code listings on JavaWorld. Part 1 details the basics os a Hello World service. Part 2 describes the Spring DM product and adding Spring to OSGi. And Part 3 covers several web deployment scenarios and issues. Also, Joseph Ottinger has an OSGi for Beginners on The Server Side. None of these guides gave me the full picture... I only started to grasp it all once I wrote a sample myself. All told, I spent about 12 to 16 hours with OSGi and I'm really happy I did. Java 7 isn't due until early 2010 and few shops will upgrade before late 2010. So the earliest you'll see JigSaw is 2011... 3 years from now.Why wait? Why not just click a few of the above links and get started now? After having tried to write an Eclipse RCP app, I'd stay away from this. The Activator class and related configuration just ticked me off after a while. Besides, you traded XML for Manifest files; doesn't eliminate externalized configuration. Nevertheless, I guess most of what you're trying to do here is achievable using java.util.ServiceLoader with, if not less, pretty much the same amount of configuration. That's an age old pattern that I first saw in the JAXP libs and was finally released with Mustang. Very interesting article, once again! But the idea is to use any of the available scripting languages, by selecting the language in the combo. I've adapted it to be used as an OSGi bundle providing access to the bundle context object enabling scripts that have access to the framework. Beautiful! Now that's what I envisioned OSGi as enabling. BTW, you couldn't resist and did mention Jigsaw at the end. Excellent little article. Loved that swipe about the "MBA program you've been thinking about." IMO, the main advantage when compared to ServiceLoaders is that OSGi frees you up from manually handling all ClassLoader glue code while giving you a nice high-level API. Off-course you can leverage some heavy-weight containers to avoid manually dealing with class loaders but you will still have to do a lot of plumbing yourself. BTW, your blog schema is not very good for code stuff. The content column it's too short. I got that, but I think OSGi is too much baggage for the functionality it provides. As for the example Hamlet provides and scriptconsole4j, I think JSR 223 already provides for multiple language engines; trying to run multiple incompatible/conflicting implementations of the same language engine in the same JVM just seems to me an 'invented' problem. But, to each their own. Well written article all the same. Sorry I came out a little strong in the last post; have bad experiences of Eclipse. @all - On my current project we have Groovy 0.3 script deployed in the field. The rest of the project can't upgrade to anything newer because it would break existing deployed clients. In fact, the example screenshot showing the | as argument delimiter is the culprit. This is my real problem at my real job. I wish it weren't invented! We've worked around other language syntax issues from 0.3 using metaprogramming, but the final solution requires something like OSGi. For us at least.